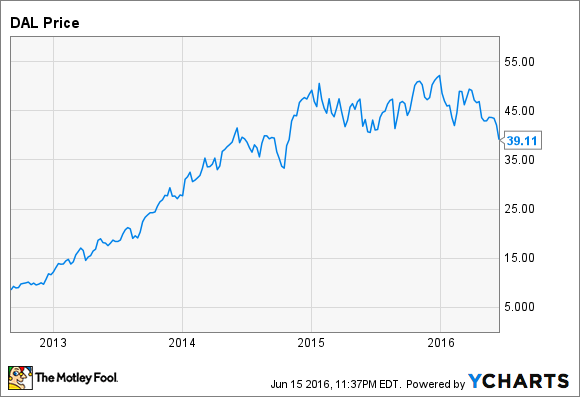 Can Delta Air Lines, Inc. Stock Get Back on Track? After a tough year and a half, Delta Air Lines stock could be ready for takeoff soon. Between Labor Day of 2012 and the beginning of 2015, shares of Delta Air Lines (NYSE:DAL) surged more than fivefold. However, for most of the past year and a half, the stock has been stuck between $40 and $50. Recently, Delta Air Lines stock has come under pressure after CFO Paul Jacobson hinted at an investor conference that the company could miss its Q2 unit revenue guidance. In the past week, the stock price has fallen below $40. However, if Delta's revenue growth initiatives start to gain traction in the second half of 2016, the stock could finally get going again. In the past year, numerous U.S. airlines have reported high single-digit unit revenue declines. By contrast, while Delta's unit revenue performance hasn't been stellar, its unit revenue fell by only 3.3% in 2015 and has declined by less than 5% year-to-date in 2016. Thus, Delta is closer than its peers to stabilizing its unit revenue. Looking at Delta's Q1 performance, unit revenue was down significantly in every region of the world, but with the biggest decline in Latin America. However, Delta's management has pointed to revenue tailwinds coming later this year in three of its four regions. Let's take a look at a few key developments that could help Delta return to unit revenue growth by early 2017 at the latest. In the domestic market -- which produces more than two-thirds of Delta's passenger revenue -- Delta has hurt itself thus far in 2016 by increasing its capacity 5% year over year. That was more than the market could handle, especially since several other airlines have also grown their capacity at an abnormally high rate year-to-date. Delta currently plans to reduce its domestic capacity growth rate to 4% in Q3 and 2.5% in Q4 by trimming capacity in underperforming markets. This, along with slowing growth at many of its rivals, should lead to better unit revenue trends. Delta is reducing its domestic capacity growth over the next two quarters. Image source: The Motley Fool. In Latin America, Delta has sharply reduced its capacity to Brazil, where the economy has fallen into a deep recession. It is also implementing smaller capacity reductions in underperforming markets in Central America. These efforts should lead to better results by the fall. Meanwhile, in the transpacific market, Delta has been cutting unprofitable capacity in Japan for a couple of years. These efforts are starting to bear fruit. In addition, the strengthening yen and stabilizing fuel surcharge levels will support a return to unit revenue growth, although that will be offset to some extent by lower currency hedging gains. On the flip side, rapid competitive capacity growth in Asia -- especially China -- will continue to pressure transpacific unit revenue for the foreseeable future. Even so, Delta may be able to return to unit revenue growth in this region by the fall. By contrast, Delta expects conditions to get worse in the transatlantic market in the near future. Demand remains fairly healthy, but has been impacted by terrorist attacks in Paris, Brussels, and Istanbul over the past year. Moreover, airline capacity has been growing way too quickly in this region, driving down fares. In addition to its efforts to cut capacity in underperforming markets, Delta has been working hard to boost its revenue through better customer segmentation. At the low end of the market, Delta has rolled out basic economy fares that don't allow flight changes, upgrades, or advance seat selection. Meanwhile, Delta has been emphasizing paid sales of first class and extra-legroom seats, rather than giving them away as complimentary upgrades. To grow sales of its Comfort+ premium economy seats, Delta has started selling Comfort+ as a separate fare on most of its routes, rather than forcing customers to purchase it as an upgrade to a standard coach fare. Even with all of these initiatives, Delta may have a hard time returning to unit revenue growth before the end of 2016 -- but it should be able to get close. By 2017, Delta's revenue initiatives will have had more time to work, which could return Delta to sustainable unit revenue growth. Delta stock currently trades for less than six times the company's projected 2017 earnings. As Delta's unit revenue trends improve over the next 6-12 months, investors will get more comfortable with the company's ability to maintain its profitability. That in turn will help the stock recover to a more normal earnings multiple -- potentially driving large gains for patient investors.